If new sharing tools are needed to help reach Japanese- and Asian Americans with a gospel presentation that made sense to them, then new ministry aids also are needed to help Christians grow in their relationship with Christ and help them serve Him in ways that also made sense to them. From booklets to articles, the ministry aids Iwa has developed are valuable training resources for anyone ministering to Japanese- and Asian Americans. This unconventional handbook was written from the perspective of God the Father who offers suggestions on how to spend a weekly date—Sabbath--with him. Iwa believes that Sabbath is a key to the evangelism that needs to take place in the Asian American community. This practical handbook goes through the stages and steps of how to bring a person to Christ, from the initial introduction to a commitment. Developed out of Iwa’s evangelism training workshop, “Hearing the Gospel with Asian American Ears,” it’s a booklet unlike any other, as it attempts to flesh out what the process of relational evangelism actually looks like. This seven-unit series represents the cumulative wisdom of Iwa Founder Stan Inouye gained through his over 30 years of equipping leaders to minister more effectively in Japanese- and Asian American churches. 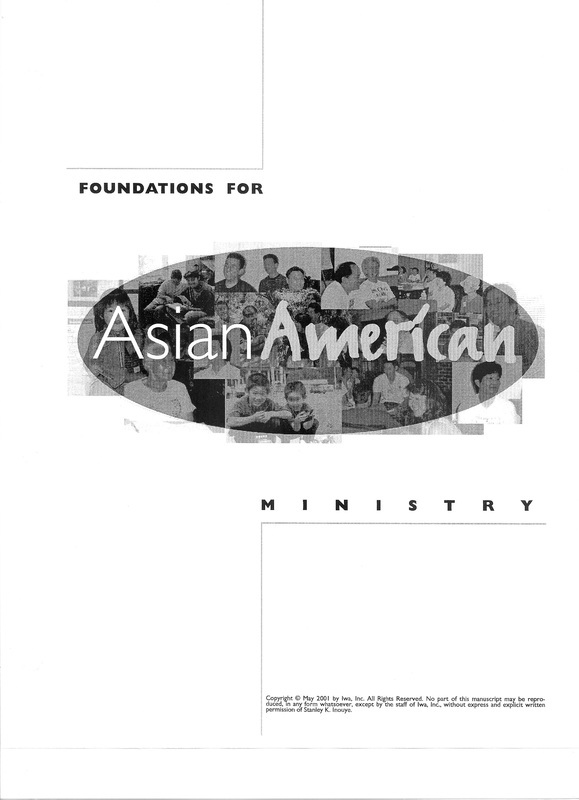 It covers the following topics: Biblical Foundations for Ethnic Ministry, How to Identify and Identify With the Asian Americans God Wants You to Reach, How to Design More Effective Ministries for the Asian Americans God Wants You to Reach, How Culture Shapes Effective Ministry to Asian Americans, How Being Bicultural Shapes Effective Ministry to Asian Americans, How to Introduce Positive Change in the Asian American Church and Community, and How to Identify and Select Leaders in Your Asian American Church.